I wrote about this deal back in July but, as it is still running for another six weeks, I thought it was worth a reminder. 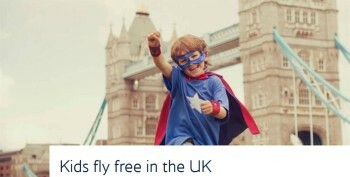 British Airways is currently running a bigger and better version of the ‘Kids Fly Free’ offer which it has run in the past. This is a genuinely good deal with no catches or small print. Until 1st November, two children under 12 will fly entirely free when accompanied by an adult. There are genuinely no catches attached to this offer. You can find full details at ba.com here. The offer only works for point-to-point trips to or from Heathrow – you won’t find a trip such as Leeds – Heathrow – Berlin gets any cheaper if booked as one ticket. Remember that children under 16 travel free on Heathrow Express now. Given that adult tickets can cost less than £6 one-way when booked in advance, this does give the potential for a cheap family break in London. The ba.com offer also includes a special deal on Novotel hotels but I imagine most Head for Points readers will have some hotel points to spend or a chain-specific promotional target they want to hit. Note that the terms and conditions specifically state that you will be in trouble if you book two child tickets along with a ticket for yourself – in order to reserve a full row of seats for yourself – and then you turn up at the airport without any kids …..! My review of the InterContinental Vienna and where to find the best breakfast in town! Because of course no family living around London could possibly want a break in Leeds, Belfast, Newcastle or Inverness! I asked my two and they didn’t. They wanted to go to Vegas. I am in Scarborough in 3 weeks, making my annual pilgrimage to the Premier Inn. yeah but I had to setup BAEC accounts for them and then add them to a family account. Hope that was the right way to do it. Bit of a novice question but my partner’s company is going to book me a ticket to Hong Kong either BA or Cathy. How do I then link it to my BA account to get the tier points and avios? I booked this a week few weeks ago for October half term – it’s is a decent offer. Got myself, 2 kids& infant on same booking for under £100 rtn to belfast. The Mrs on a RFS so we get a bag to check in as well. BA were kind enough to group our keep our seats together over the two bookings. Hotel is the Premier Inn, £80 for two nights. Cheap break 🙂 Hope the weather isn’t too bad! if you are travelling with children (under 12YO) on different bookings, BA will always ‘link’ your bookings (phone them) so that you can all sit together. In theory it’s just 1 adult with the child but in practice their IT system just seats you all together. Might help to check in T-24 in ET. so that plenty of seats are available.